A. Select tyre – which tyre fits my vehicle? Find your tyre size by one of the tyres to be replaced. Look at the specification found on the sidewall of the tyres you are replacing. Please note that the information may differ on summer and winter tyres. Yes No – Tyres with the better profile usually belongs on the rear axle Different size / dimension (unless the vehicles handbook state it is allowed for front and rear axle). Different size / dimension (unless the vehicles handbook state it is allowed for front and rear axle). No No – unless:Installing the spare tyre if you have a flat tyre and to go to a workshop. Can also be labelled MS, M & S, MS, MS or Mud and Snow. Snow tyres should have this labelling and are specifically developed for driving in winter conditions. Can be labelled with a snow flake or M.S, M&S, M-S, MS eller Mud and Snow. 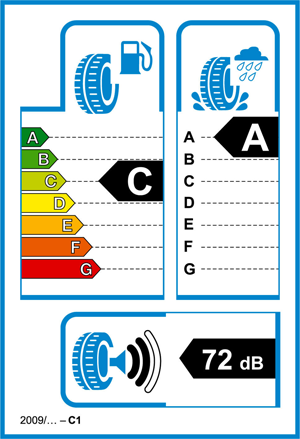 Snow tyres should have this labelling and are specifically developed for driving in winter conditions. Winter tires have a special rubber compound, which ensures that winter tyres do not harden when temperatures drop. Summer tyres has a rubber compound that ensures that it do not too soften at high temperatures. This blend also allows higher speeds with less wear. Here it also is important to find a balance between low rolling resistance and good grip in the wet driving conditions. All season tyres are tyres that suit both summer and winter conditions. These are not especially designed for winter driving and thus should not be used when winter conditions prevail. Furthermore, it is worth mentioning that these tyres have a softer rubber compound, making them wear a little faster and less fuel efficient than season tyres..
What information do I find on the sidewall of the tyre? Measurement table: What width of tyres fit my rims? Uniform Tire Quality Grading ( U.T.Q.G.) Makes it possible to compare three properties of all tyres, these are; wear, traction and temperature resistance. The tests are partially carried out under racing conditions. The tread depth of new tyres is about 8 millimetres. The legal limit for minimum depth of the tread on your tyres is 1.6 millimetres (does not include winter tyres, then it is 3 millimetres). However, it is recommended that tyres have at least 3 millimetres (4 millimetres for winter tyres). Furthermore, it is recommended that you install tyres with the same tread pattern and depth on all four positions, at least axial (front and rear). Over time, the tyre loses its softness. UV and weather conditions causes war on the rubber compound. As a result, there might be cracks in the rubber layer, which in turn can increase risk of traffic accidents. The tyre may only be classified and sold as new if the manufacturer date is less than 36 months old. The EU Tyre Label was introduced by the European Union and is applicable for new tyres as of November 1st 2012. The label shows fuel consumption, safety and noise level of tyre. The label also makes it easier to compare tyres. The letter A indicates the best rating, while G represents the worst. How can I make my order at Tirendo.co.uk? 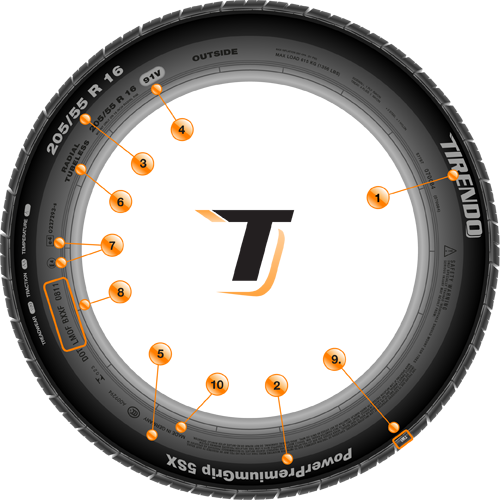 At Tirendo.co.uk you can easily look for your favourite tyres without any obligations.When you find the tyres you want to order, we will kindly ask for your e-mail address, billing address and delivery address. The easiest way to find the tyres that suits your vehicle is to use our search tool on our homepage. You start by choosing the type of tyre. Please make sure you have the correct tyre dimension on the tyres to be installed on vehicle, note the dimensions of winter and summer tyres might differ. Please enter the dimensions you need. Depending on your preferences, you can also limit the search by choosing a specific brand or season. After you have entered the information above, and we will make an offer customised for you. Once you have decided which tyres you want to buy, you can complete your purchase. You will find a summary of your chosen products in your cart. You do not only get an overview in your cart, you can also easy change the tyres you have chosen – either in terms of type of tyre or number of tyres to be purchased. You can also remove products you do not want. In next step we will kindly ask you to enter the information necessary to complete your order. Then select your payment method and you will get an overview of your order information. After reading and accepting our general terms and conditions, you can complete your order. After receiving your order you will receive an order confirmation. The order confirmation will include a tracking number, so you can easily track your order. If you have any questions you can contact us at support@tirendo.co.uk. Here you can easily pay with VISA, MasterCard, Maestro or American Express. Your card will be charged when your order is made. As your credit card information go through a SSL process, we ensure the highest level of security when purchasing with us. All personal data is encrypted and cannot be seen or ready by anyone. If you choose to complete your payment with PayPal, at the end of your order you will be routed to PayPal. If you already have an account at PayPal, simply log in and confirm your order. If you have not used PayPal before, you can register as a guest or create a new account, and then confirm your order. Once we have registered the payment, your order will be sent. Usually, it only takes a few minutes before we register your payment by PayPal. Once your order is made through PayPal, you will receive an order confirmation. Please note, that in rare occasions, it may occur processing problems at PayPal, which we cannot influence. Note that a transaction through PayPal will be issued from our webpage, you cannot go to PayPal’s webpage to complete your order, then we will not link the payment with the order. Please keep this in mind when choosing PayPal as your payment method. If you choose to return your goods, your amount will be transferred back to your PayPal account. What do you do when your money is back in your PayPal account? – Keep them in your account for further use, or transfer the amount to your bank account – it is your choice. This is options you have in your PayPal account. This is beyond our control. At Tirendo the delivery is free of charge within mainland Britain. For Island delivery we add delivery costs of £8.50 per tyre. For complete wheels and rims: The prices are per complete wheel / rim plus shipping costs of £9.90 per wheel / rim within UK. Who are our logistics partners? The delivery is made by Deutsche Paket Dienst (DPD). In certain occasions, it may also be made by GLS. Both are specialized in the field of tyre supply and have a close collaboration with us. Where can I get my tyres delivered? The delivery time partially depends on when we receive your payment, however, it generally takes about 2-5 business days. Can I pick up my products myselft? No, unfortunately this option is not available. The two alternatives for receiving your products are described above. What happens if no one is present when the products are delivered? We will attempt to deliver three times. After the first attempt, our logistic partner will leave you a message. Using the contact information provided, you can arrange a time for the next delivery. How do I find my fitting partner? You can easily find a fitting partner by entering your zip code. The tyres will be delivered to the fitting partner ready to be installed. What is the price of installation? Prices for installation vary depending on fitting partner. You will see the prices when ordering. We apologize for any short-term price changes made by the fitting partner. As the fitting partner decides the prices of their services, we cannot guarantee that the prices will be the same as when making the order. In order to exercise your right of cancellation you have to inform us (Tirendo Holding GmbH, Pappelallee 78/79 10437 Berlin, E-Mail: support@tirendo.co.uk) about your decision to cancel this contract giving a clear statement (e.g. by mail or email). For additional information, please see our Return Policy page. We will process your request as soon as possible and offer free returns and/or a new delivery free of charge. Tirendo offer a 14 day return policy from the day you received your goods. If you have any questions please contact our customer support at support@tirendo.co.uk.